In organizations planning is a management process, concerned with identifying goals for firm’s future direction and determining on the missions and resources to achieve that target. To fulfill the goals, managers may develop plans such as a business plan or even a marketing plan. Planning always has a purpose. The purpose may be achievement of certain goals or targets. 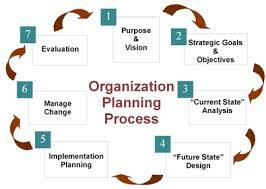 Organizations Planning reduces the risks involved in modern business activities. It aids in organizing all available resources.